I was very excited to receive delivery of this painting this week. 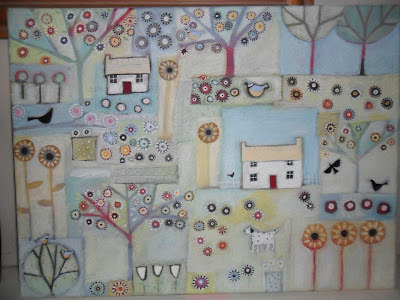 It's by the very talented artist Louise Rawlings. It's mixed media (mainly acrylic and gouache) on a boxed canvas and 395x295mm, so quite small considering all the detail. I really like the inclusion of her English Setter, Alfie. Louise also works freelance for Phoenix Trading, as well as other publishers. You can see more of her work on her facebook page.